These baby shower activities and games are sure to make the party more meaningful and enjoyable for everyone! Baby shower activities get everyone participating and really let everyone show their love and support for the soon-to-be mother. And, although they are not games with a prize at the end, they are fun and help everyone enjoy the shower. I will explain each activity and what you will need for them. So Have at it and Have Fun! This is more of a quiet, meaningful activity. Best for baby showers with family members. Preparation for this baby shower activity: In your invitations, you may want to tell the guests to think ahead of time come with thoughts and advice for the baby as he or she grows older. Buy blank birthday cards and envelopes, one for each guest who is coming. Write the phrase "Happy 1st Birthday!" on the first card, "Happy 2nd Birthday!" on the second card, and so on from 1 to however many guests you will have. How to run this baby shower activity: Give each guest a pen, a card and an envelope. Each guest will get a different numbered envelope. Instruct the guests to write on their card a birthday message to the baby. Each guest will write the birthday card specific for the age of the baby on their envelope. The cards may include humor, stories, memories, thoughts, and advice appropriate for that age. On each of the baby's birthday's as he or she ages, the mother will read the corresponding card for that year. This is very meaningful to the expectant mother and the baby will get to know her/his family better. A popular activity to do which let's the expectant mother (and baby!) remember who was at the shower. Preparation for this baby shower activity: Buy a light colored, flannel baby blanket or hooded baby bath towel. Also buy various colors of non-toxic fabric paint or markers. Include instructions in the invitation to have each guest think of a thought, poem, or note they would like to write on a remembrance blanket for the baby and the mother. How to run this baby shower activity: Throughout the course of the shower, have each guest autograph the blanket or towel and also, if they want, write a note, poem or thought with the markers or paint. Give the expectant mother the blanket or towel at the end of the shower, and she and the baby will have it forever! Preparation for this baby shower activity: Before the shower, get a big container that is in someway related to your theme (e.g. a little Noah's Ark, a mini garbage can for Oscar the Grouch, a big Honey Pot for Winnie the Pooh, or something more simple like a big plastic Tupperware with stickers and decorations related to your theme.) When you send out the baby shower invitations, be sure to explain that you will be making a time capsule during the shower, and ask them to bring any items, newspaper clippings, headlines, current CD's and popular music of the day, trends, fads, coins, and anything else that would be descriptive of the times that the baby was born in. This is a lot of fun and very meaningful to the mother & baby (when she/he grows up). How to run this baby shower activity: During the shower, have everyone explain the item(s) that they brought and why they chose to put them in the time capsule. After everyone is finished and all the items are in the container, present it to the soon-to-be mother. This one makes the expectant mother feel supported by everyone. Preparation for this baby shower activity: Before the shower, in the invitation instruct each guest that they should come "pregnant", meaning that they should wear large clothing and stuff their shirts with a pillow or two. How to run this baby shower activity: Everyone remains "pregnant" with their pillows for the entire shower so the expectant mother will feel more at home. A fun variation: During the shower, everyone remains "pregnant" until it is time to open gifts. Have each guest remove their pillows and stuff their gift under their shirts. Then the celebrated mother-to-be feels each guest's bulging belly and tries to guess what the gift is. Preparation for this baby shower activity: Before the shower, buy enough notecards so each guest will have one. How to run this baby shower activity: During the shower, pass out one card to each guest and a pen. Instruct everyone to write down a question that a first-time mother might ask. For example, "What should I do if my baby has a fever?" Then have everyone turn their card over and hand it to the person on their left. Now, have everyone write down the answer to their own questions on the different person's card. Then have everyone read their card question-and-answer combo, which usually turn out to be hilarious! This is a sweet and fun flower baby shower activity that is meaningful for the expectant mother. Preparation for this baby shower activity: Print off a copy of this Flower Baby Shower Activity Card for each of your guests. How to play this baby shower activity: Give each guest a copy of the Mother's Baby Blossom card and a pen or pencil. Have them write down a memory they have of something that their mother did for them when they were young that helped their life blossom. Have everyone read theirs when everyone is finished and then collect the cards and give them to the expectant mother to always remember. Just as the lucky person who catches a bride's bouquet is supposedly the next one to get married, baby showers have a similar tradition. OK, no one actually throws a bouquet of flowers at a baby shower, but this is the next best thing! How to run this baby shower activity: As the mother-to-be is opening up her gifts, on the 7th gift, award the person who brought that gift with a prize! 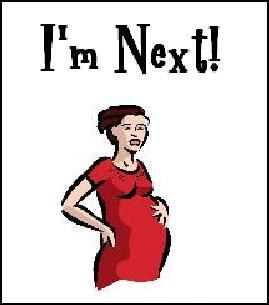 Because she is the next one who is supposed to have a baby!! Explain to the group that the number 7 represents perfection and that it is the purpose of the baby shower to make the experience of birth or adoption as perfect as possible. Also, before the shower, make a sign like this one (or just print this one if you would like!) and give it to lucky number 7 to wear on her shirt or blouse. Printing Instructions: Right-click on the image to the right and select the "save picture as..." line. Then, you will be asked which directory to save it to. Just save it onto your desktop or in any folder you want. Then on your desktop, double click on the image icon. When the image opens up, set your printer to the desired paper size and print the image (in color or black/white).